The baby has grown from roughly 18 inches long to 19 and has grown from 5.25lb to 5.75lb. Of course these are just estimated averages and each baby varies but towards the end of pregnancy she will be putting on half a pound a week, she's busy plumping up for the birth. All her major organs are mature and complete at this stage even though I'm not quite term just yet. I'm term next week and another two weeks and I'll be full term. I wonder how far I will get before she decides to make an appearance! I had my 36 week midwife appointment last week and everything went really well. I was measuring high on the graph again, just like I did with Noah but the midwife let me in on something I didn't actually know. She said that these growth measurements mainly go off the Mum's anatomy, if she is tall (like I am) she will probably measure large as they have a longer torso. I'm not sure how true that is but it would make sense in my case as I'm tall and I measured large with Noah despite him being a dainty 7lb 2oz when he was born. She told me that baby was head down now and is almost engaged, she's on the brim! I've always thought that the baby was big as her movements have always been so strong and forceful compared to Noah's but I was also told that she doesn't feel like a big baby, so that gives me a little relief when it comes to thinking about labour! Phew! Baby girl is still super active and strong, especially in the evening or when I'm in bed at night. There have been times recently when her movements have taken my breath away, quite literally! As time goes on they just get stronger and stronger and more impressive, she can really pack a punch! I love getting into bed at night, speaking with her and feeling her move and wriggle in response, it's magical. I'm okay! There's a lot of the same symptoms that I've been experiencing for the past couple of months, back pain, pelvis pain, heartburn, indigestion, exhaustion, nausea, insomnia and so on but nothing to shout home about. On a whole I don't feel too bad really. 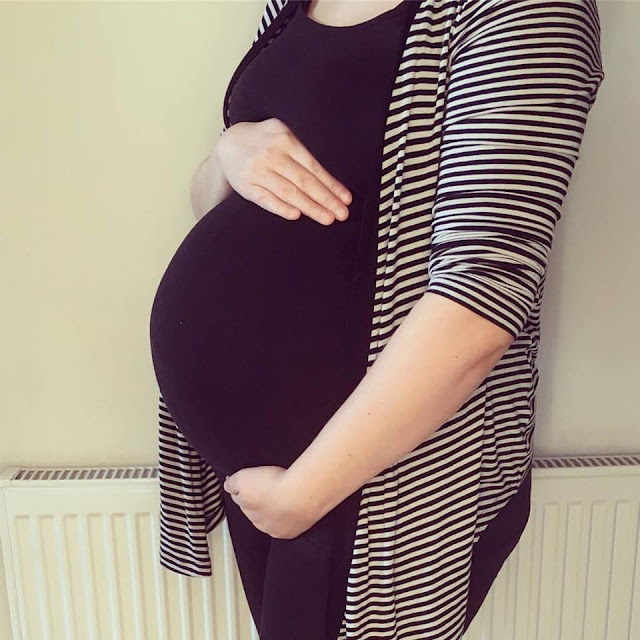 I have however had a couple of moments where I've thought I may be going into labour but I think it's my body's way of getting ready for everything and it still wouldn't surprise me if she came a little early. 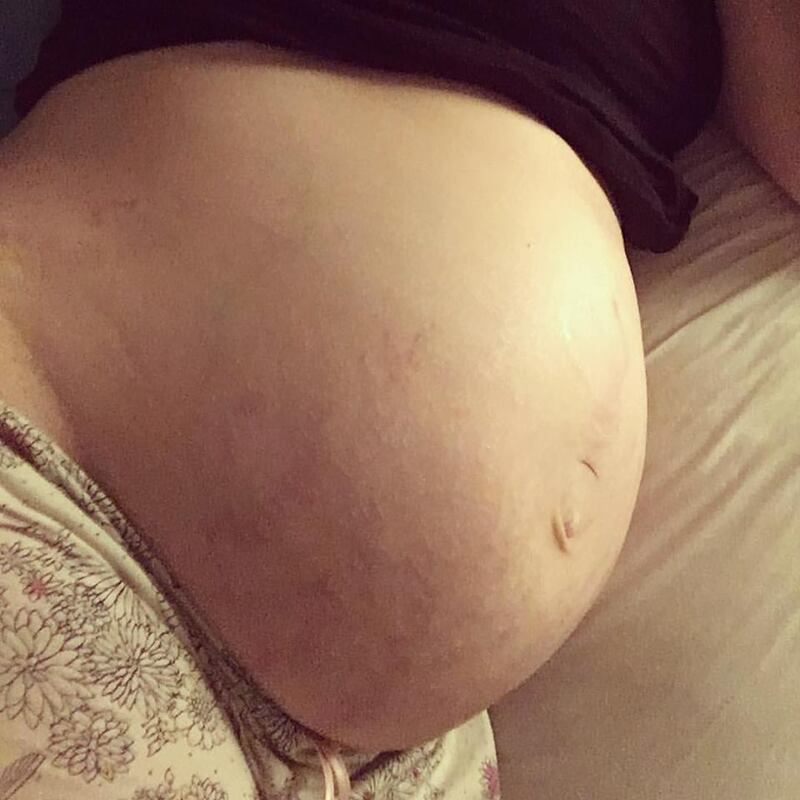 I've been experiencing pressure and pains down below, been using the toilet a lot, I've been feeling anxious and all sorts of other things which can sometimes mean labour is imminent but it can also just be pregnancy related so it's impossible to tell. Bump wise I feel huge and you can now tell that I've dropped, maybe another sign she won't keep us waiting too long? Only time will tell. Sounds nice that you and baby to be are interacting i.e. your chatting to her, and her response in moving around. Definately baby bump, looks like will be a healthy baby weight. Maybe you will find returning to pre-pregnancy weight easier this time. As with baby being due next month, and it not being long till spring :- You may find that you are quite active dealing with Noah and his baby sister. Getting outdoors taking Noah to and from nursery. Walks in the park etc. Probably a nice family time getting outdoors exploring, learning, socialising etc. Best Wishes! The picture of your baby bump was making me wonder if you had managed to get any video of your daughter to be moving, wriggling etc. Would maybe be nice for her to see, maybe even watch with the family sometime.